Happy Kitchen Sink Stamps Monday! 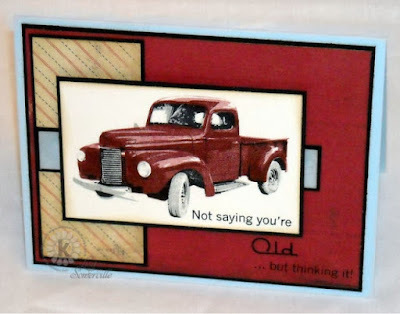 Thanks to those who played along with last weeks Kitchen Sink Stamps Contest! Can you believe no one correctly matched the designers to the stamp sets? If your name appears above, head back to this forum post and enter your new guesses by Wednesday, June 19th, midnight PDT. In my post last week, I mentioned that I did not show a card made with the set I requested, I also mentioned that two people requested the same images for a set. What I didn't tell you is that the one set was then broken down into two separate sets, something even I didn't know. I didn't show a sample of that set either last week. One more easy hint, if you know where KSS stamps are located, then it should be easy for you to guess Maria's set. I had a card prepared for my post today, unfortunately I am unable to share it with you, as I cannot pick up WIFI on my laptop and retrieve my saved photo, (I'm blogging from my iPad), so I'll be back next week with some new cards! In the meantime, here's a look back a KSS card previously posted on my blog.